OUTTA SIGHT presents the second platter in the Give 'Em Soul series showcasing some of the rarest and hottest R&B sounds of the 21st Soul Century. The "Yellow" Edition brings together 14 more killer cuts that are on every DJs hit list. 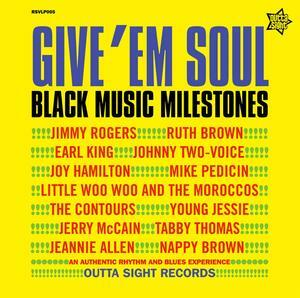 These major label milestones dating from 1954 to the early sixties feature key artists in the world of Blues, R&B and Soul including Ruth Brown, Earl King, The Contours, Young Jessie, Nappy Brown, Wynona Carr and the amiable pimp Johnnie Morisette, more commonly known as Johnny Two-Voice for his uncanny knack of performing in both his natural vocal register and falsetto.